Founded to honor Coretta Scott King’s humanitarian work, the Coretta Scott King Book Awards has for nearly 50 years drawn attention to “outstanding books for young adults and children by African American authors and illustrators that reflect the African American experience.” Each year the awards jury receives hundreds of books and over 100 unique titles for consideration for this prestigious prize. The Coretta Scott King Book Awards Donation Grant Committee reviews grant applications and ensures that these application submissions will directly benefit young people by selecting organizations to receive the books, including a complete set of the winning titles, once the CSK Book Awards Jury deliberations have concluded. Art Aids Art is a US nonprofit which established the eKhaya eKasi Art and Education Center in Khayelitsha, South Africa 10 years ago. They opened a Multicultural Children’s Library in the township with help from a previous Coretta Scott King Awards Donation Grant. Materials in the library are translated by staff into the local language, isiXhosa, and are used to support community engagement and literacy and cultural instruction for children and adults. The Center offers after-school care, life skills instruction, reproductive health programs, homework support, and visual and performing arts classes. The books received from the 2018 grant will support continued instruction, independent reading, and the organization’s community-wide celebration of its 10th anniversary. The Athens Housing Authority, University of Georgia College of Education, and Parkview Community in Athens, GA are collaborating to add the books they receive from the grant to a community library they are developing for Parkview residents. The new books will support workshops and tutoring related to the arts, storytelling, dramatic play, and community activism. The library will focus on individual, family, and community literacy development, while also bringing together local residents and leveraging historic memory and knowledge from community members. 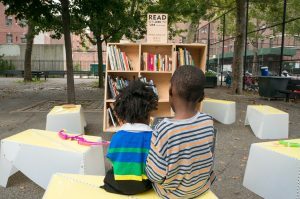 For the past seven years, the Uni Project in New York, NY has built pop-up learning centers in “book deserts” in New York. Loaded with books, materials on STEAM subjects, and more, these custom outdoor learning centers are very attractive to children. 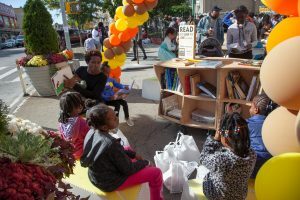 Joined by a cart featuring new titles received from this year’s grant, offerings such as author readings, reviews written by members of the public, book discussions, and other participatory schemes will enable the books to reach a broad audience as they (and the ideas they inspire) will travel throughout New York City neighborhoods. The Coretta Scott King Book Awards are presented by the Coretta Scott King Book Awards Community of the American Library Association’s Ethnic and Multicultural Information Exchange Round Table (EMIERT). In 2019, the Coretta Scott King Book Awards will be celebrating its 50th anniversary. Applications for the 2019 Coretta Scott King Book Award Donation Grant will be available in the fall of 2018. Please review the criteria and consider applying in the fall of 2018, and or encourage other eligible organizations to apply! Elisa Gall is the Youth Collection Development Librarian at Deerfield (Illinois) Public Library and Chair of the Coretta Scott King Book Awards Donation Grant Committee. A former school librarian, Laura Simeon is the Young Adult Editor at Kirkus Reviews. She is a member of the CSK Book Awards Donation Grant Committee.